More and more Big Data projects we with Datarella are involved in demand not only administrative or legal security layers but also state-of-the-art technical frameworks to provide the maximum security there is for business as well as petsonal data. To provide our clients with sustainable solutions we have partnered with Ethereum and its spin-off Ethcore. The Ethereum framework enables us to build business models on top of it, using a very sophisticated blockchain approach, smart contracts and elements of the DAO concept and finally, our own product, the Datarella Data Trust. Since the blockchain, smart contracts, DAO and especially Ethereum are quite new to the Big Data scene, we aim to make them better known to a broader audience. 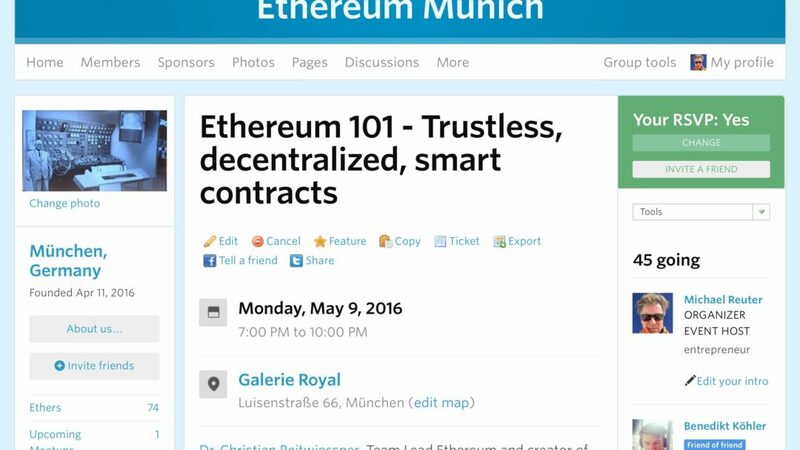 So we have started the Ethereum Munich Meetup as a platform for presentations, discussions and development of Ethereum-based ideas, concepts, use cases, projects, etc.. If you are interested in all things Ethereum feel invited to our regular meetups!